These sidewalls can be used with either pole or frame canopy tents to create a little more privacy or simply to provide more protection from the sun or inclement weather. They are made of white 13-oz vinyl and have built-in snaps for faultless installation. The wall ends are designed to overlap 5' where ends meet. The sidewall is hemmed on all sides with stainless steel snaps on the top edge. This product is available in three sizes: 8' x 25', 8' x 45', and 8' x 65'. Note: This item is for one sidewall only. For complete tent packages see the Party Tents area of the website. * Please Note: This is for the Sidewalls ONLY. 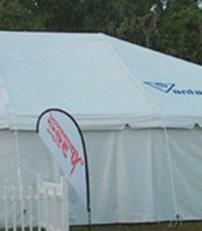 Please see our Party Tents section or call Customer Service for complete tent packages.